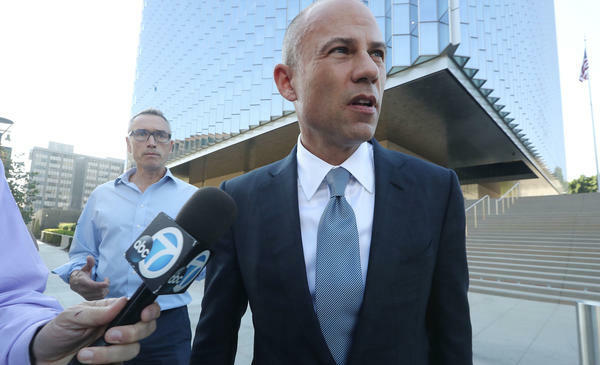 Michael Avenatti, attorney for Stephanie Clifford, speaks to reporters as he leaves the U.S. District Court for the Central District of California on Sept. 24, 2018, in Los Angeles. Avenatti has been arrested on federal bank fraud and wire fraud charges. Lawyer Michael Avenatti, who attained national prominence as a legal antagonist of President Trump, has been arrested on federal bank fraud and wire fraud charges. Prosecutors in California say he embezzled client money to pay his own expenses and debts. Avenatti was arrested in New York on separate federal charges. He was released released on $300,000 bond, according to The Associated Press. Avenatti spoke to reporters after he was released, saying, "As all of you know, for the entirety of my career I have fought against powerful, powerful people and powerful corporations. I will never stop fighting that good fight." He said he was "highly confident" that he would be "fully exonerated and justice will be done." Authorities there say he tried to extract more than $20 million from shoe giant Nike by threatening to use his ability to attract public attention if the company failed to meet his financial demands. Avenatti had written on Twitter on Monday, before the case against him was announced in New York, that he planned a press conference about "a major high school/college basketball scandal that we have uncovered." Geoffrey Berman, the U.S. attorney for the Southern District of New York, detailed the alleged scheme in a news conference on Monday. He described how investigators had recorded a phone call in which Avenatti threatened a lawyer for Nike unless the company met his demands. "I'll go and I'll go take $10 billion off your client's market cap. But I'm not f***ing around," he said, according to prosecutors. Avenatti was to appear in federal court in New York City before Magistrate Judge Katharine H. Parker. He became a cable news fixture during the time he represented the former adult film actress Stormy Daniels, who says she had a sexual relationship with Donald Trump years ago. Avenatti also targeted Trump's former personal lawyer Michael Cohen, who has admitted to arranging a scheme in which Daniels was paid ahead of Election Day 2016 to keep quiet. Daniels was one of two women whom Cohen arranged to be paid at that time to minimize political problems for Trump, Cohen has since acknowledged. Trump has acknowledged the payment to Daniels but denies the underlying allegations about a sexual relationship. But it wasn't only in that case that Avenatti sought to cause problems for the president. Avenatti also alleged that Cohen had been reimbursed by a powerful Russian for the payment to Daniels — which became part of revelations about Cohen's de facto lobbying business, in which he sought to sell access to Trump during the president's first year in office. And Avenatti said he had a client who could corroborate allegations about Trump's second nominee for the Supreme Court, Justice Brett Kavanaugh, although her charges were never substantiated. More recently Avenatti has had less time in the limelight; he was arrested in connection with alleged domestic violence but not charged, and he lost his highest-profile client in Daniels, whose given name is Stephanie Clifford. Daniels wrote on Twitter that she was "saddened but not shocked" by the news about Avenatti's arrest on Monday, in part because she had decided weeks ago to "terminate Michael's services after discovering that he had dealt with me extremely dishonestly."